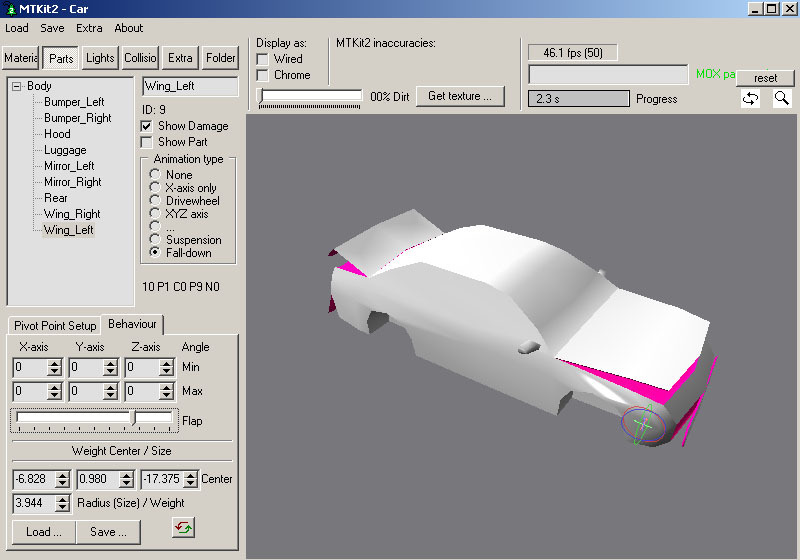 This tutorial shows step-by-step how to make parts in WR2 add-on car using Lightwave3D and MTKit2. 1. 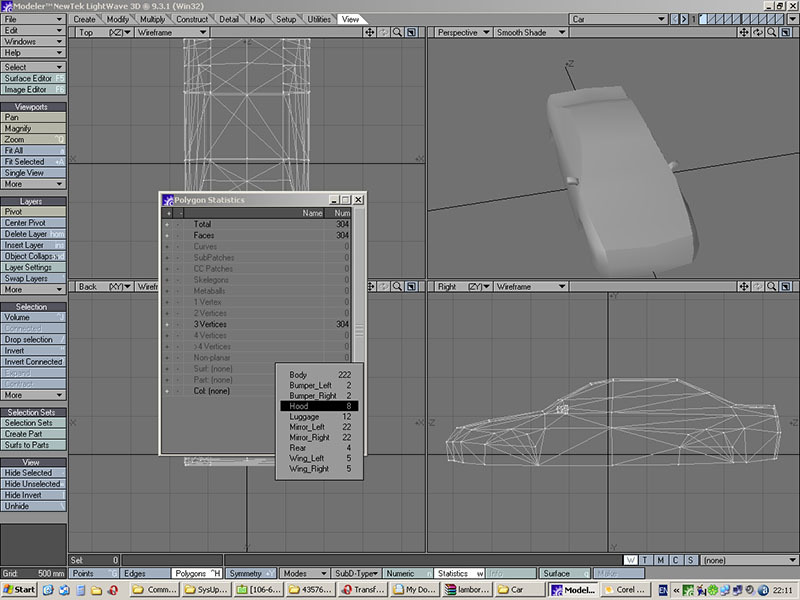 Open your model in Lightwave3D. 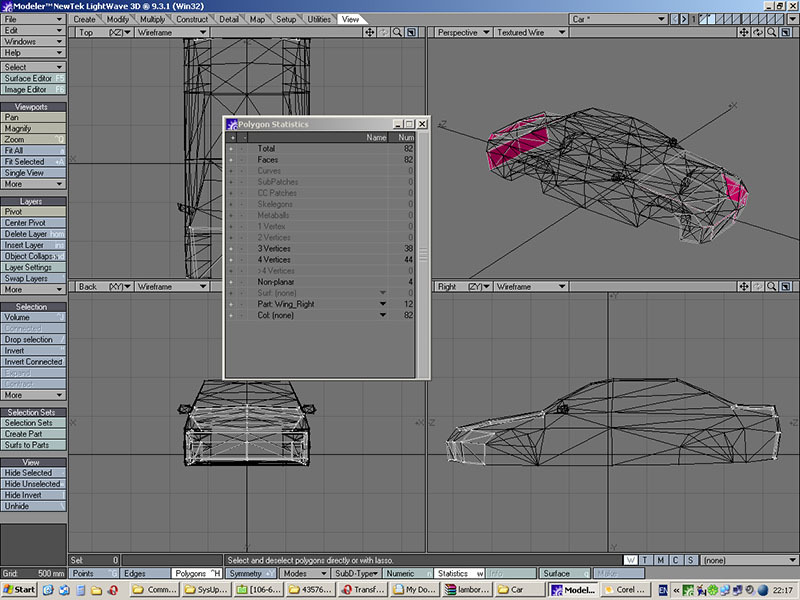 In this example it’s a simple car model used in WR2 sceneries. 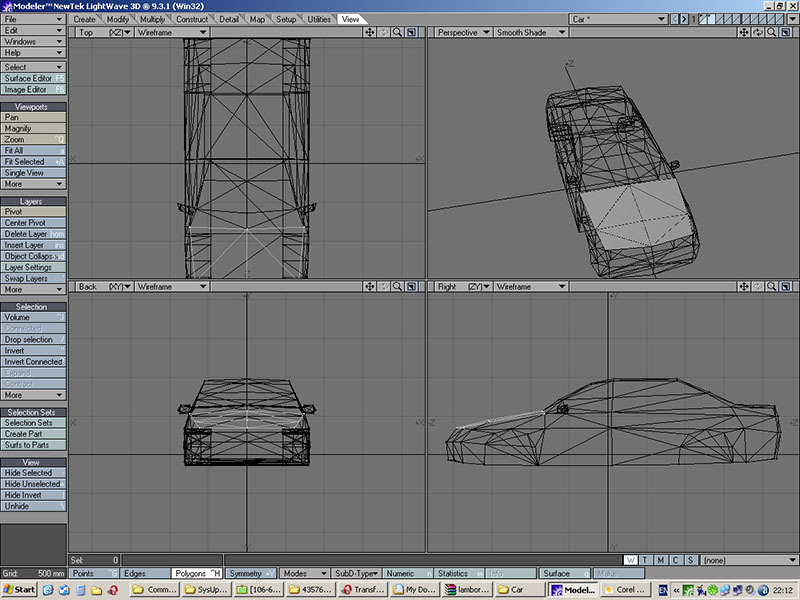 Note: we will be working in Polygon mode all the time. 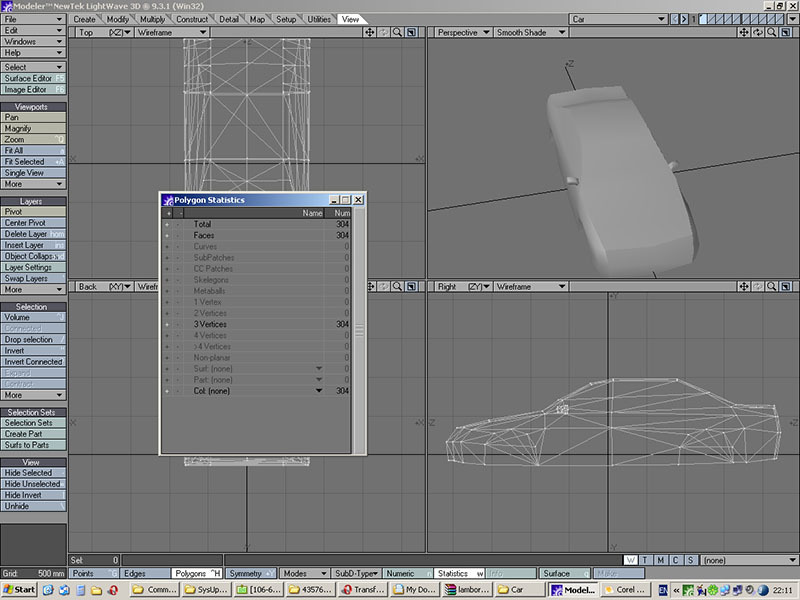 Note: you can download example car used in this tutorial, see link in the end. 2. Go to View tab and click Create Part button from Selection Sets sub-section. 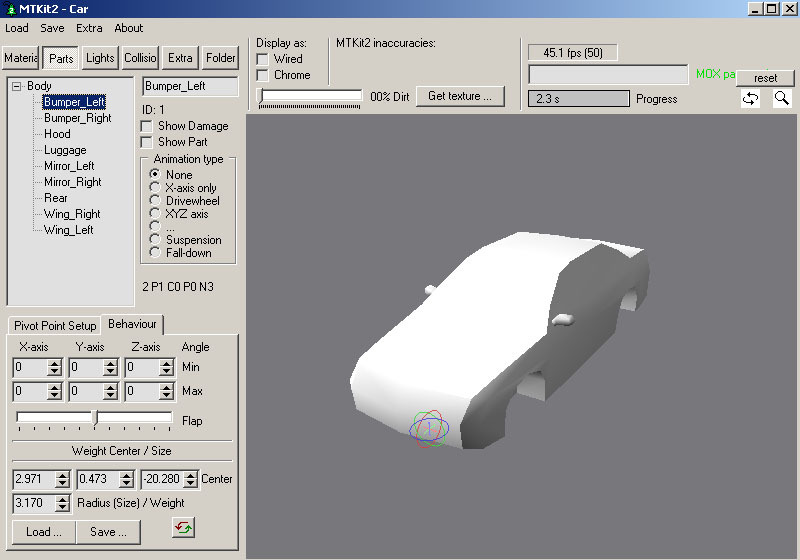 Assign part name to a car – “Body”. 3. 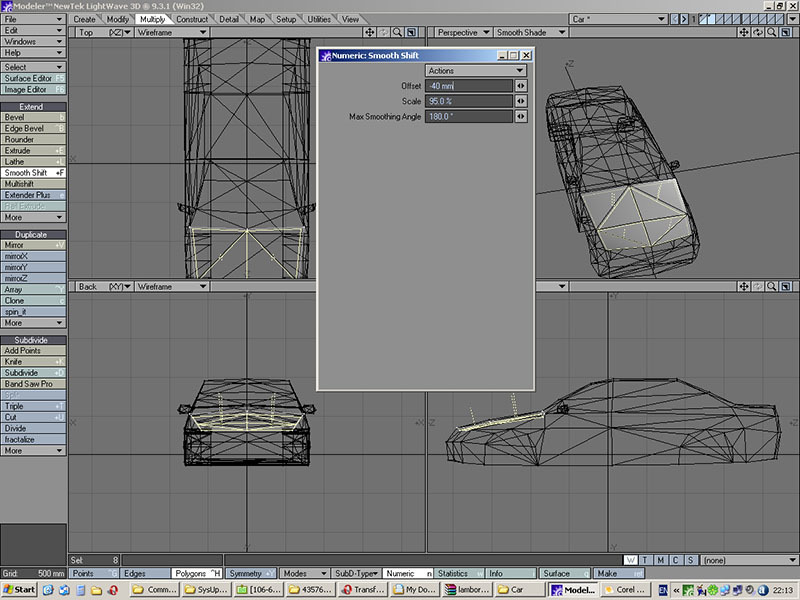 Now select polygons that will be a damage part (You know how to select polygons in Lightwave, right?) and click Create Part button. 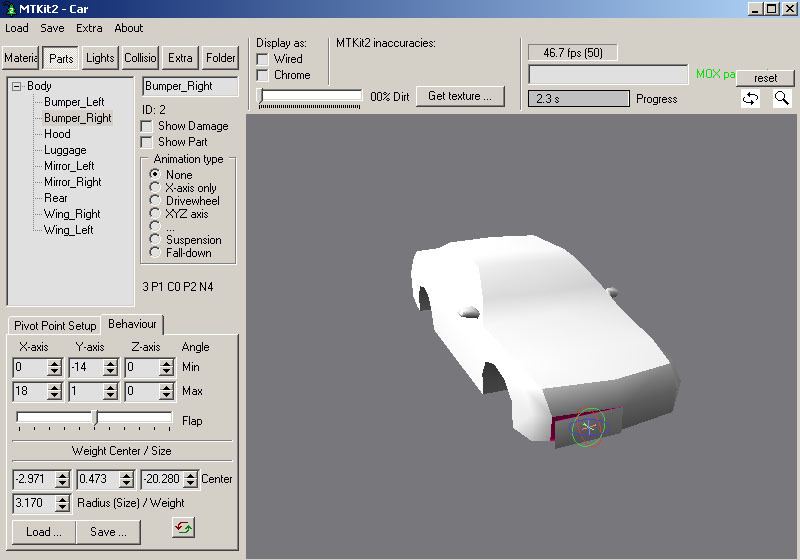 Assign new part name – “Bumper_Right”. Note: try to give parts logic names, this will help later and in MTKit2 setup. Note: do not move parts into new layers, otherwise they don't have smooth surface with other parts. 4. Make another part and give it another name. For example "Wing_Right". 5. Side mirrors can be damage parts as well. Keep on assigning parts. Note: you can open any WR2 car to see which damage parts are usually made. 6. After you assigned all parts you wanted, open statistics frame with “w” key. This frame contains lots of info about model and allows to select polygons by given conditions (type, number of sides, group belonging, etc..). 7. 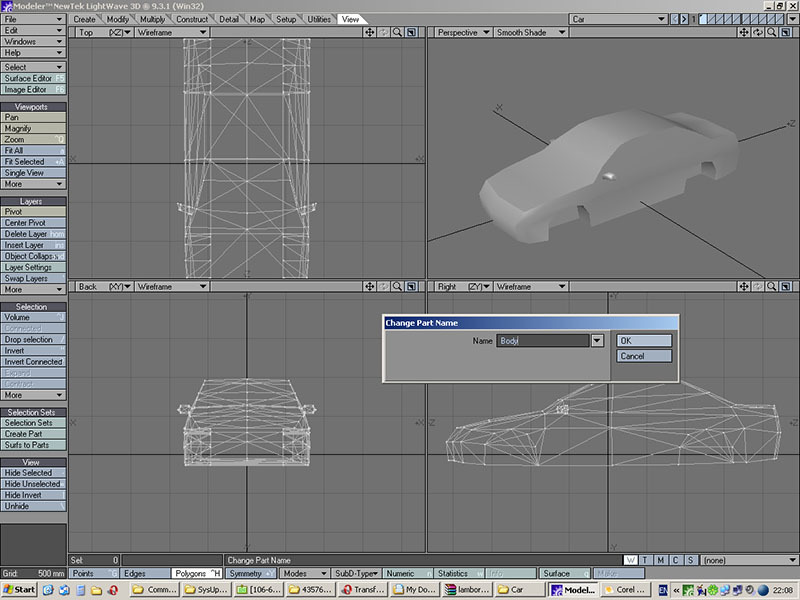 Press small downward arrow next to Part (none) line and you will see list of parts in the model. Select one part. 8. 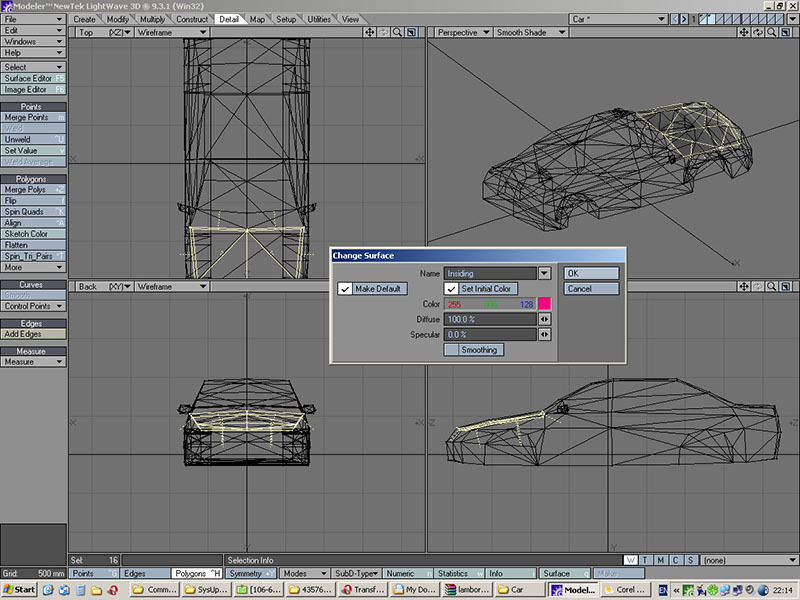 Press plus sign (+) on the left side after you selected a part and Lightwave will select polygons belonging to selected part. 9. Now you need to copy these polygons to a new layer. We will make parts inner side. 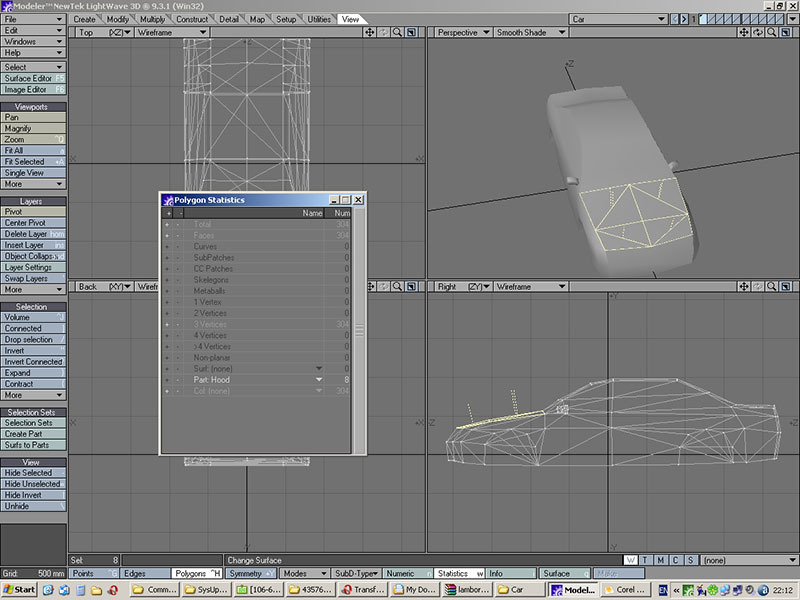 Hint: select car layers as background. 10. Go to Detail tab and press Merge button to remove any unwanted seams, we don't need them on parts inner side. Then press Flip button in Polygons sub-section to invert polygon facing so they face inside. 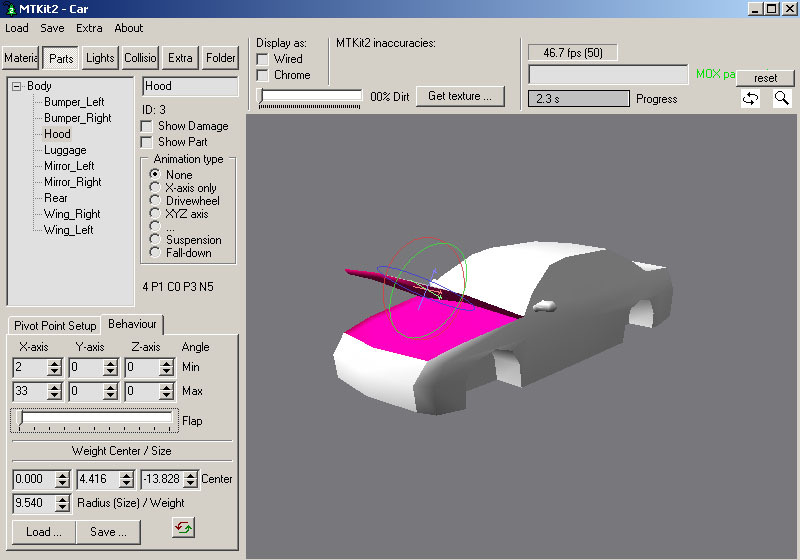 Max Smoothing Angle – 180° (this will form a smooth inner side as it should be). 12. Press “q” key and issue a new surface that will be used for parts inner side. 13. Newly created inner side should have same part name as outer side (by default it inherits parent poly part name). 14. Repeat steps 9-13 for all damage parts (make each parts inner side in separate layer). When done move all parts insides into one layer. Apply all parts insides with proper surface used in step 13. 15. Copy/Paste all inner sides into new layer. Flip all polygons so they face outside. Assign them to car body part. 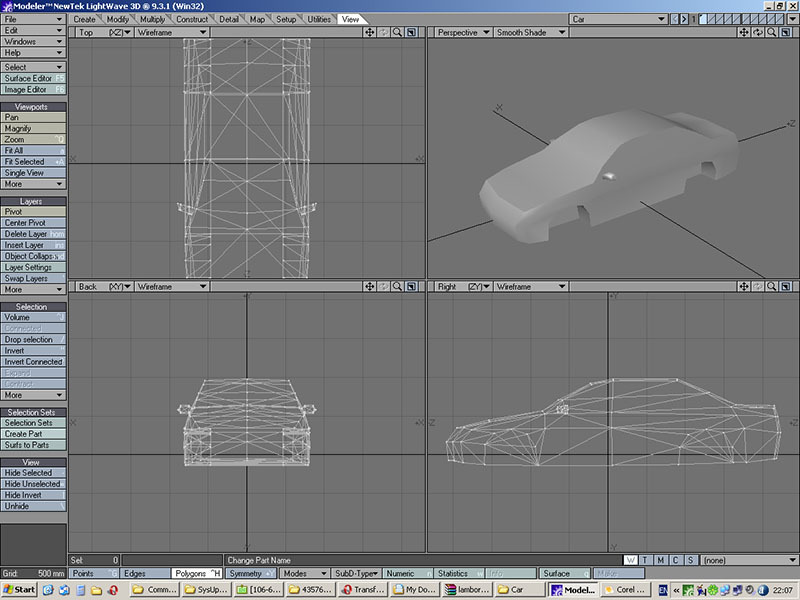 They will become car body inner side. 16. 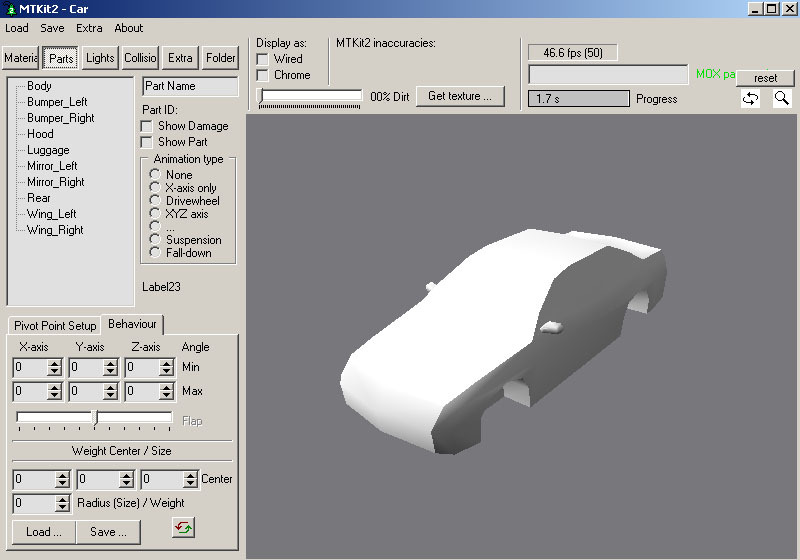 Now you have car layer with parts assignments, parts inner sides layer and car inner side layer. Select all layers active. 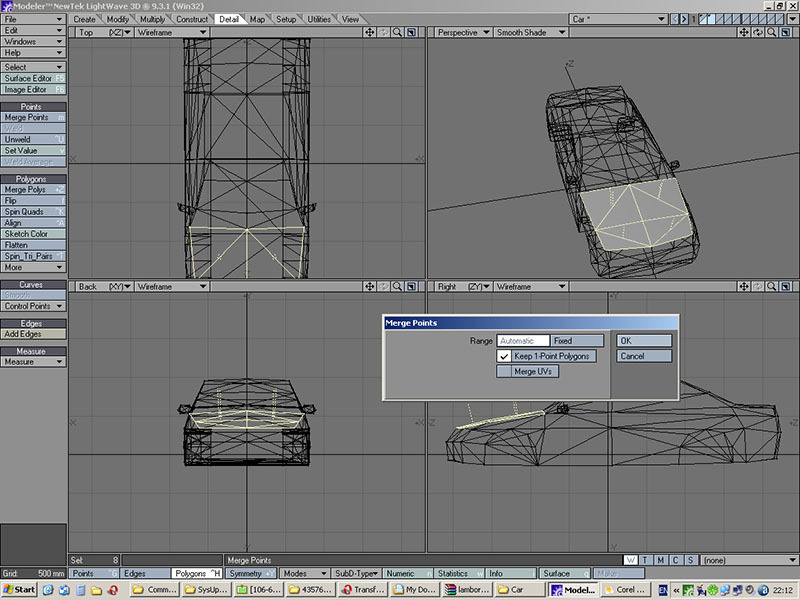 Go to Multiply tab and press Triple button, this will split all polygons into triangles. Open statistics frame and check if you have any non-triangle polygons left. Save LWO file. Note: safely delete any non-planar or 1 or 2 sided polygons. 17. Now it’s time to move to MTKit2. 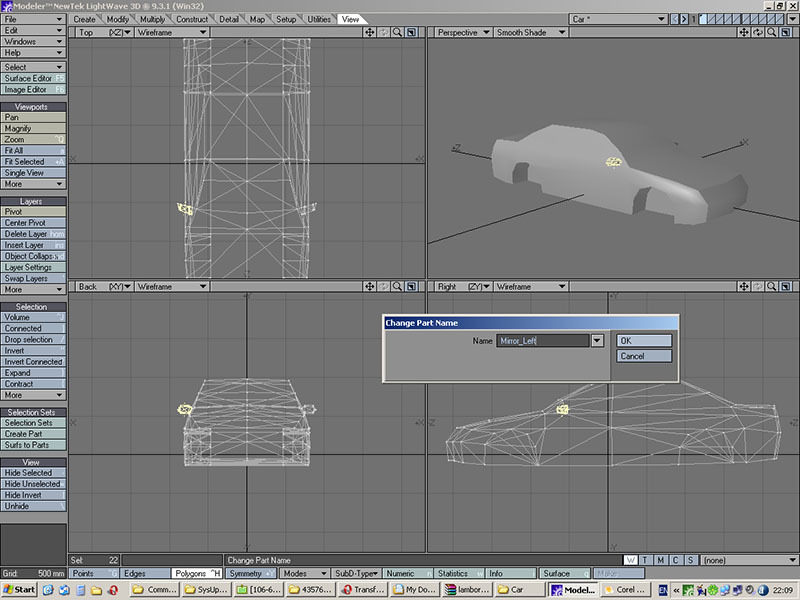 Load car LWO file. Go to Parts tab. There you will see a list of parts your car has. Note: I won't say anything about other MTKit2 tabs, they are not important in this tutorial. 18. 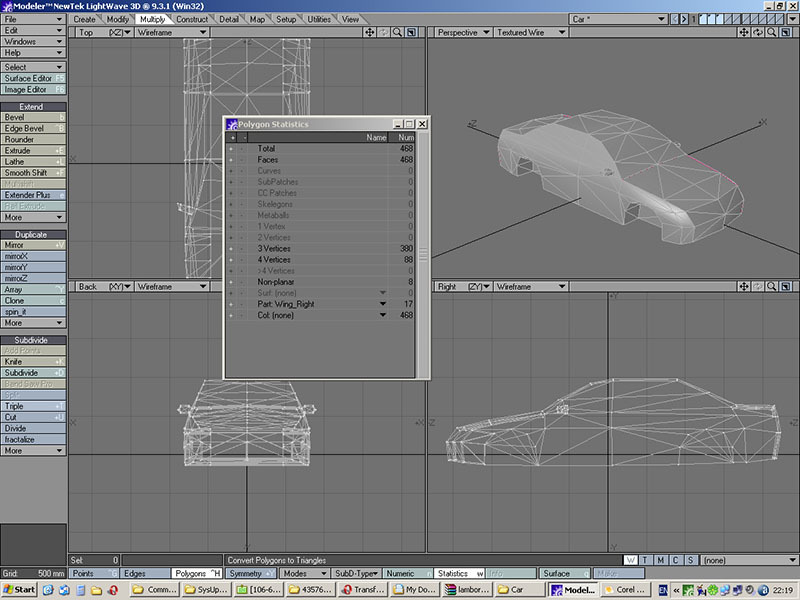 Parent all parts to cars body by dragging and dropping their names in the tree view list. You should have something similar to this picture. 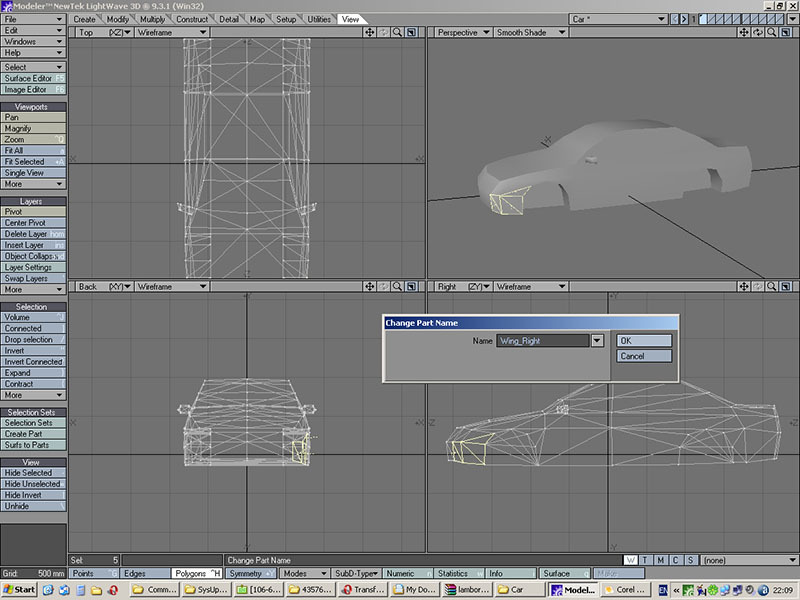 Note: Each part has own ID, you should use that when you make lights that are attached to certain part other than car body. 19. Select a part and open Pivot Point Setup tab. 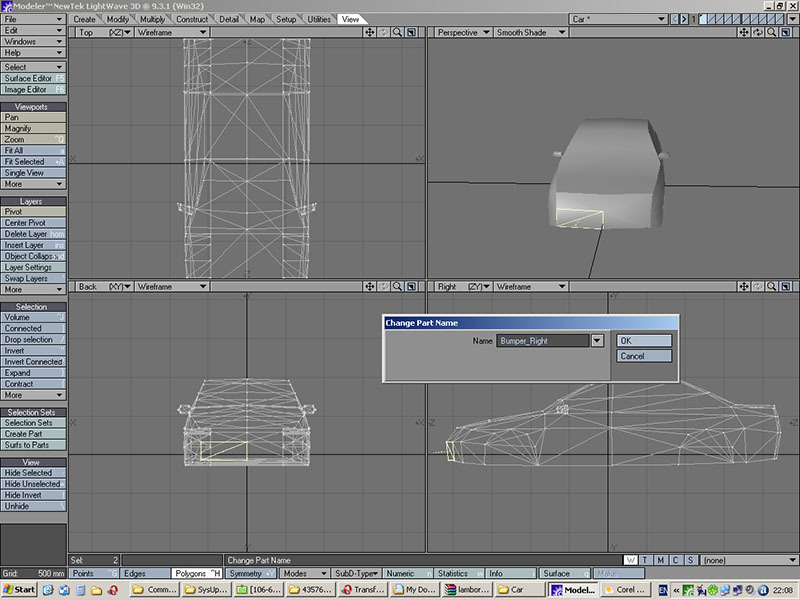 There you setup pivot point location for the part – this is a point where part is attached to parent part. Part will flap around its pivot point when it's damaged. Use small arrow buttons to select pivot point from available and click Use button. 20. Some parts like hood which have 2 hinges need to have different approach. 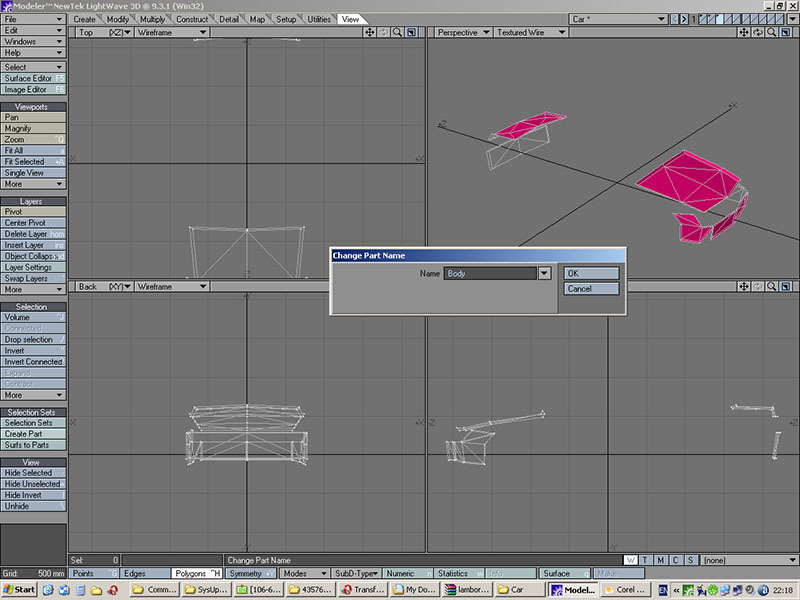 Select one hinge point as pivot and click Use. Then from controls below set X axis (in this example it’s X axis) and set its value to Mid. Setup all parts pivots. As described above (steps 19-20). 21. When you made all parts pivots switch to Behavior tab. 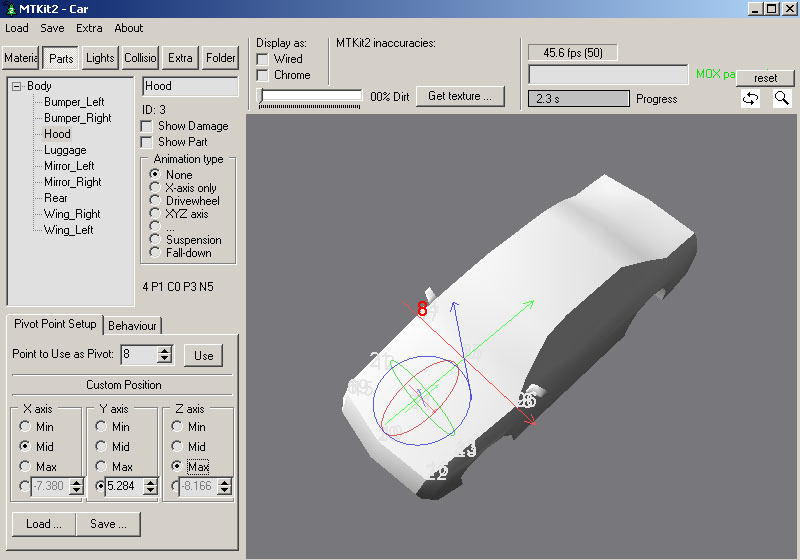 There you need to fill Min/Max flap values – limits between which part will flap when damaged. Use Flap slider to see preview. Also set parts Radius. More radius means more weight as well. 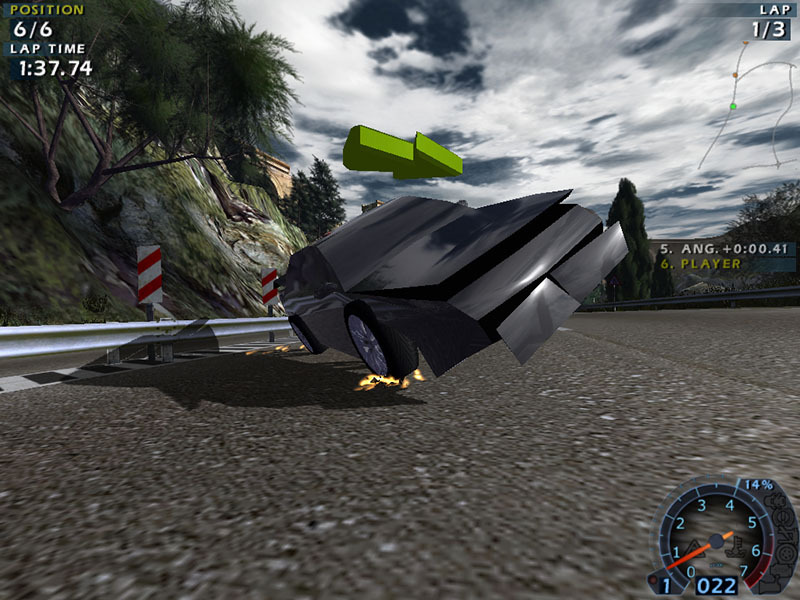 Parts that fall-off without flapping – “Fall-Down” type. 23. Save your parts setup so it won’t get lost when you re-import new LWO. 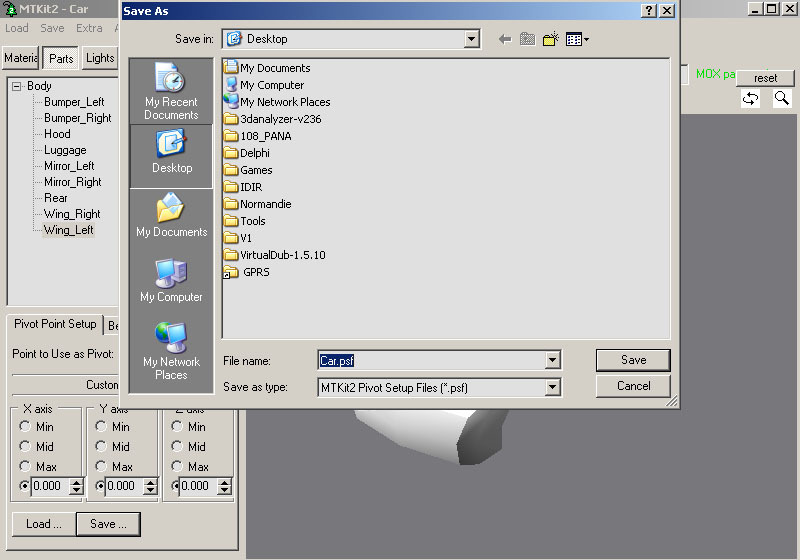 Hint: pivot point setup editing is allowed only until you save MOX, so save it to file before saving MOX as well. 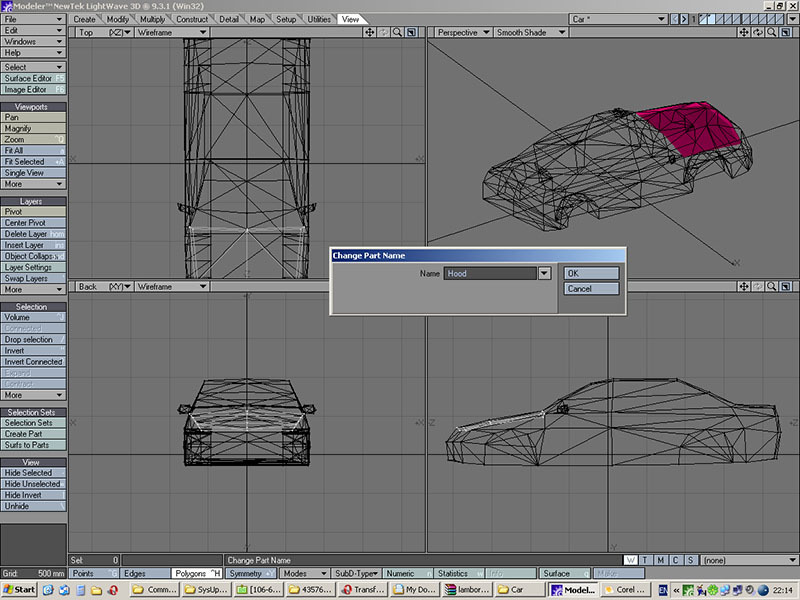 Note: files are called car.psf (pivots setup file) and car.pbf (parts behavior file). 24. Save MOX file. Set “Show Damage” flag and move Flap slider to see damage parts all moving together. 25. 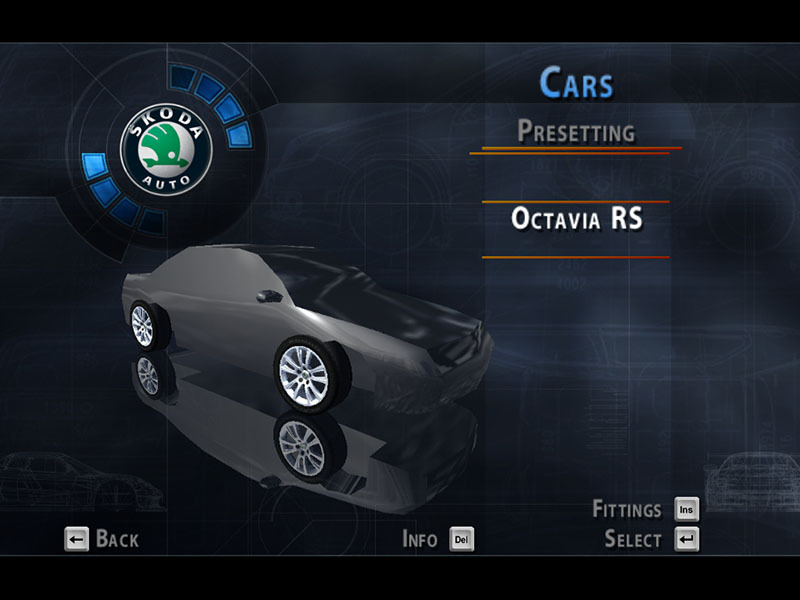 If all went right you’ll see your car in World Racing 2 menu. 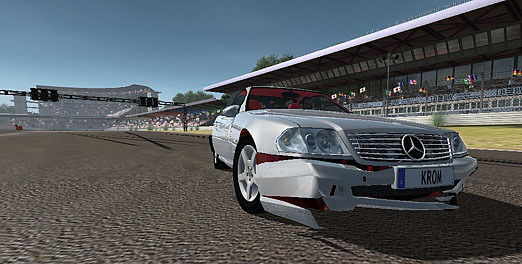 Notice that damage parts should not be noticeable at all until you damage the car in game. 26. This is how it should look in game when damaged: no see-through holes, all neat and nice. This tutorial is written by Krom (kromster80@gmail.com).